A little recognition from those outside the development worker bubble can go a long way toward encouraging more good and promising work. I’ve been thinking a lot about the good, promising work throughout the global development industry, and the fact that the mainstream media seem to undervalue how high-quality coverage contributes to global development efforts. Fame, cheap and short-lived as it can be, is priceless motivation-not necessarily because people like being famous, but more so because development workers crave affirmation that their work is or might be making a meaningful improvement upon the world. Infamy as well can be a powerful disincentive for poor behavior on the part of development workers. The launch of IDEO.org, the official non-profit arm of already-famous global design consultancy IDEO. I look forward to hearing more about their work applying Human-Centered Design to some of global development’s toughest challenges. 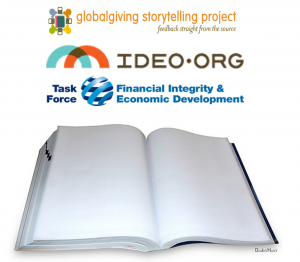 GlobalGiving’s Storytelling Project starting to gain steam. I was fortunate this year to cover it myself, for Nextbillion and for Fast Company’s Co.Exist. You don’t have to read what I wrote to do it, but I highly recommend learning more about this fascinating project to create localized feedback loops that put the power of impact evaluation into the hands of the target community. The rise of social impact bonds. All the way back in February 2011, I came across a story about the White House’s experimenting with these and a NextBillion story about their potential elsewhere. I was hoping to hear more about them. Maybe I’m not looking hard enough-or maybe that’s my point: that I shouldn’t have to, assuming these are the game-changers they seem like they could be. Global momentum for cracking down on illicit financial flows. Did you know for every $1 in foreign aid that arrives in developing countries, $10 has already escaped via illicit financial mechanisms? Some of that $10 is illegal, from bribes and kickbacks or black market arms deals, but most is just legal accounting trickery combined with overseas tax havens. But just because it’s legal doesn’t mean it’s right, especially when you consider it’s depriving governments of local funding that might otherwise reduce or end aid dependency. While there has been mainstream media attention on some of the above, specifically illicit financial flows, coverage has been largely scarce and distant-with the obvious exception of the New York Times’ Nick Kristof. Yet even Kristof insists (for good reason) on focusing his apt storytelling powers on the story of the individual at the receiving end of global development work, rather than the workers themselves. I applaud his work and I wouldn’t encourage him to stop, but it still leaves much on the table when it comes to covering the global development industry. The Guardian’s Global Development Community comes closer to what I would expect as a mainstream industry desk for global development, but a controversial October post from Millennium Villages Project and famous foreign aid cheerleader Jeffrey Sachs, and the resulting whirlwind of online discussion, illustrates the further need to separate the industry from would-be watchdog media. While mainstream media could do a better job investigating global development and utilizing their star-making power to put a spotlight on informed examples of the good and promising work, development workers aren’t exactly best prepared to pursue, let alone welcome wholeheartedly, broader media attention. GOOD and recently Fast Company are two examples of broader media outlets that include more than usual coverage of global development, and they do a better job distinguishing between journalists and expert voices, but even to these specialized progressive media the global development industry remains mostly aloof. The love of jargon and acronyms runs far and deep in global development, as does the habitual need to write proposals and reports meant for a very narrow audience. Development workers don’t communicate about their work poorly to average people because they don’t like communicating or average people; they are just required to spend most of their time communicating only to each other. Blogging and even Tweeting are great channels for development workers to get their feet wet communicating to broader audiences. I don’t expect every development worker to blog or Tweet, but if you’re out there on the margins deciding whether it’s worth your time, consider that the more you practice telling your story, the more prepared you’ll be for the day you’ll get your chance to inspire the next generation of leaders. Also consider that there is a pretty decent chance you’ll gain a deeper appreciation for the history and context of development work. Don’t get me wrong; I do not oppose mainstream media covering celebrities and sports to any reasonable or even slightly excessive extent. I certainly consume my fair share of such coverage. Celebrity and sports, with a dash of sensational political coverage and some business news, are what turn profits for mainstream media. But it is my hope that one day, after the internet-fueled re-configuration of the media settles down again, those profits will help pay for high-quality coverage of the industry dedicated to ending global poverty. And when that day comes, I hope we’re prepared.